In our city, finding stuff from faraway places is easy, and, when it comes to giving gifts, it shows you have imagination and style! Barring an affinity for the mundane, what reason is there not to check out a few emporiums that have eclectic assortments of odds-bodkin imports? This shop is a mini-museum with genuine Soviet military uniforms, rare KGB badges, and antique Russian coins. 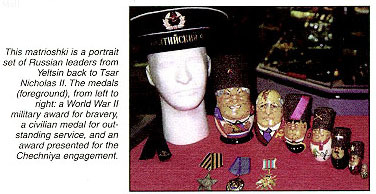 Matrioshkas, Russian nested dolls, are priced from $5 a set all the way up to one that costs $3,000, with the tiniest doll being about the size of a peppercorn. These dolls represent the generations within a family and traditionally are presented by family members. Depending on the weight and quality of the workmanship, amber jewelry is priced from $4 to $50 or more. A butterscotch-colored polished amber and silver necklace is $849. If shopping makes you hungry, try some Russian refreshments: a steaming bowl of borscht with a pirogi, or a rogaliki, with hot tea and cherry preserves. Russian Island is located on the third level of the Galleria overlooking the ice rink; phone 1.817.275.5530.